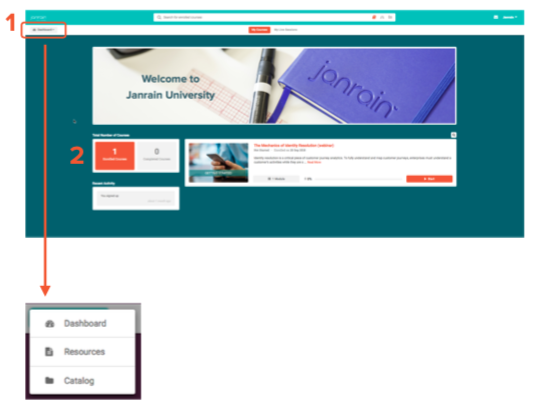 Upon login to Janrain University, you will land at your Dashboard. Click the grey Dashboard button in the upper left to open the main Menu. This menu will be visible from any page within Janrain University. Dashboard returns you to the opening screen. Resources guides you to a list of available documents and links for more information. Catalog opens the list of courses available to you. This list is filterable by topic. Courses in which you are enrolled will be displayed in the main body of the Dashboard, while other information will be visible in the left sidebar.